A new element is created by dragging the chosen type from the bar on the left, and dropping it to the desired location. The number of elements that can be inserted into a page is not restricted. This toolbar appears on top of every page in administration mode. It is the "dashboard" that allows administration of a page and access to general tools. It is incorporated in the automated menus and the site map. The "prefix" (see "administration page"), the"Name" and the “Title" appear in the title of the browser window. It is commonly accepted limit to 100 characters for all the following would not be useful for search engines. Page description: taken up by search engines, it increases the interest of the user; only the first 255 characters would be taken into account. Disable responsive layout: the responsive behaviour according to the screen width can be disabled for the current page (flexible images, automatic column rearrangement, conditional display). Page URL: It is generated automatically with a page number (ie: p135) and it appears at the end of the URL (http://websico.com/p135.html). This identifier may be replaced by text if it is relevant and will maximize natural referencing: for example, for an online gallery, it is relevant to have the name of each artist in the URL. In general it is better not to change the page ident automatically generated. Note: There must be always one home page for the site in each language, with the "home" ident. Note: It is preferable that a page ident remain the same in any language, without translation, to facilitate the transition from one language to another by the visitor. Redirect to another page: the visitor will not see that page but the one whose URL is typed in the text input; it can be an internal or external page. 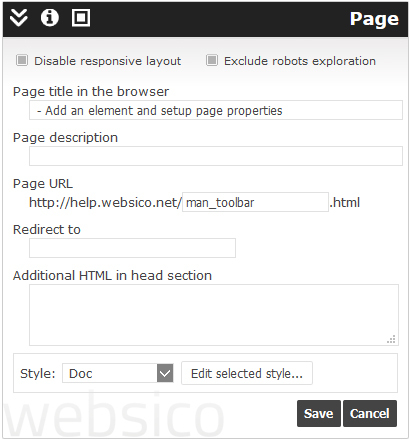 Additional HTML: advanced users can add html code in the <head> section. The page is the element corresponding to an Internet address (URL). Draft: Until it is published, a page is a draft. Any change to a page (published or not) is automatically included in a "draft" of this page. Thus, we can edit without limits and without altering the vision of published page (and site in general). Published: The page is visible to users. Click the "Publish" button, present in the toolbar when a draft is underway. All elements linked with the page can be selected for publication: you can choose to publish or not the page, the contained models, styles and the sitemap. The purpose of this operation is to maintain a page that you want off of public site and reuse it later. Create a new page starting from the one you want to unpublish. This copy becomes a new draft. Then just delete the published page. 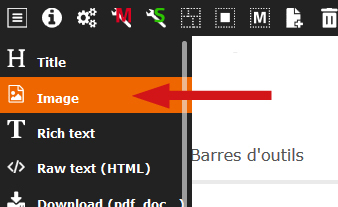 Click the button in the toolbar and choose the language of your page. It is created on the same page of action and will take the name with a (+) at the end. You can then rename and modify it as you like. CAUTION: This operation is irreversible! Note: the deletion of the public home page causes the creation of a default one. Encapsulate the page in a block and give it an absolute width. Note: To create a fixed width site, all pages must be included in block with a style where the width is fixed, otherwise the site is in variable width. Create a new page that you wrap completely in a block, then delete the block. To put a page in place of another page, give the ident of the page to be replaced to the new page.